Suggestions (polite ones ) please. Dearer models (Pro) have more cpu ram which may be a factor to consider. Wifi only models are cheaper. Apple do refurbs occasionally (as new condition) but cheaper. Educational prices are also slightly cheaper. If buying 2nd hand make sure it is factory reset and not tied to someone's (other than you) Apple Account or you may find it’s been locked and you cannot use it. Apple won’t help with unlocking. Google for info. In Aus, telcos offer iPads on plans (which can actually actually be cheaper than buying outright). This also gets you LTE access via sim card. If screen size does not matter, it would be the pro/11, because of the pencil/2nd gen.
From my experience pro/10.5, this will be ok for occasional use. If you want to do things more serious, I would take the larger model. On the smaller screen the AP-tools cover a more-than-comfortable area of the screen. WiFi-only is ok, mobile is fine if you work out of house/office. My use-case is to do my vacation pics while still on holiday. This is why I chose the smaller ipad for mobility. Off the road you need memory (the more the better, serves as a backup as well) and the mobile data. Dm1 is right the newest Apple Pencil only works on the iPads without the physical home button/latest generation. I ended up getting last year’s verison (2017) to save money for now on the 12.9 size. I like the split screen so you can work on your design on the right while having a tutorial or email etc... on the left, or have a third little video open, or switch back to full screen- it comes in handy. I also set up the virtual home button in settings. Anyways, I found a sale online at b&h photo and asked Best Buy to price match in store and they did! They also match a few other website competitors. If you buy apple care + (plus covers for accidents and I believe is cheaper to fix your iPad than if you didn’t have apple care +, the regular apple care comes with the iPads for 1 year but doesn’t cover accidents and such) with your IPad and pencil in the same transaction/same receipt, apple care + covers your Apple Pencil as well! Just check on the apple coverage website after to make sure it’s showing as covered, and contact apple if not for a email confirmation of pencil coverage. I got the silver 256 for now (last year version) with the cellular in case I ever needed it, seeing public WiFi and hotel WiFi are pretty insecure these days. WiFi only is cheaper, and you may not need the cellular option if you don’t take it anywhere or work offline when you’re out. I haven’t found the older pencil to be a pain hardly at all. The difference is in the way they charge. The newest one charges wirelessly on top of the iPad; the old one just plugs in the wall with the tiny adapter that comes with the iPad. It charges super fast so I don’t feel like I missed out on the new pencil! The new ones also have the double tap feature which is nice but not totally necessary. The old pencils are a bit heavier though. The newest iPads especially you have to check to make sure they aren’t bent and get a good sturdy case for itso it won’t bend or break when dropped. I also recommend a good screen protector; AmFilm had some great reviews on Amazon! It saved lots of people’s screens in a fall. I decided to wait for the price of the new ipad pro’s to come down and go with this for now because I loved drawing on the bigger size and having more storage than 64gb. You might just want the new one though; it all depends on your budget and preferences. Here is the link for the one I got, last years/older pencil. Just an idea if you wanted to wait for the new ones to go down in price like I did. Also, the regular iPads (not the pros) have more parallax under the pencil when drawing, aren’t as powerful, and can’t do as big of canvases in Procreate if you ever wanted to try that out. The newest iPad pros of course probably have a bit better screen than last years and are supposed to be faster, but not much for drawing. I LOVE drawing with the Apple Pencil; it makes designing/drawing so much easier! That’s a few helpful hints and tips to get you started. Hope it’s helpful for you seeing you helped me so much before. 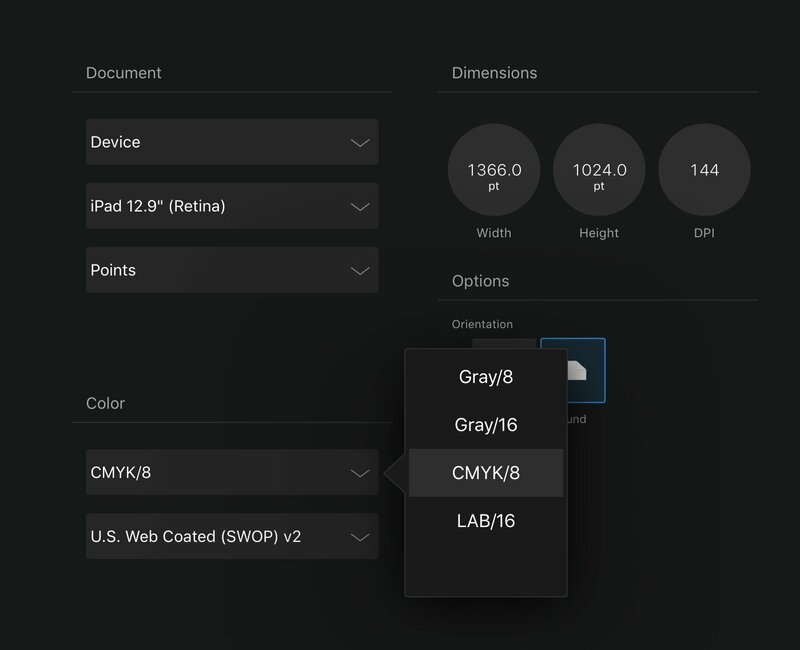 I did notice that affinity designer on the iPad doesn’t have the generic cmyk profile option, not sure which one is similar to use for same printing results. I don’t know if that matters to you in your workflow, but it’s something I just ran into. I agree with everything up there. Even before the new models came out I was able to get a 256 12.9 iPad Pro for $750. I thought it was a great deal on Amazon and picked it up. I wasn't even considering one until I saw Designer come out. Apple should be paying Affinity since it's selling iPad Pros! I am able to set the print profile just fine in the preferences, along with the color model as CMYK when setting up a new document. Is that what you are talking about? Yeah, I might not have gotten an iPad either if it weren’t for Affinity and Procreate! Yes, I used to set my document to cmyk8 in my computer and under that is where I expected the “generic cmyk profile” to be. I’m not sure which one to set it to exactly now instead making the document. The company who works with the printers said the generic would work best. I see what you mean now. "Generic" is only available on the desktop version. I actually am a printer and we setup for the US Web Coated (SWOP) v2 for compatibility then we (try) and tell it to remove all profiles on export to PDF so that it will not mess up the RIP's and large format printers. On files we have exported from Designer they have had massive pilings of ink and it should not be that way. I noticed that the transparency, even if told to be CMYK will export with an RGB profile. I've reported this as a bug. If you use PDF/x4 it will export as CMYK transparencies. @Bryce when you select CMYK Generic on Mac, what Profile is associated with it? Is it the US coated Swop2 or something else? I noted when exporting a CMYK as TIFF, the document format preset defaults to RGB not CMYK (which is available in drop menu). Choosing CMYK preset seems to sort out profiles again. Is this the issue you were seeing? I’m not sure about tiff . I pretty much use PDF but, yes it had problems with being RGB even though it said it was CMYK. I do believe i’ve Got it worked out now. That is the correct profile for us. Wow, that’s not good! Unfortunately the companies I have started designing products on usually accept a png image not a pdf format.